← Hot Cups, Wild Geese and A Giant Radioactive Walleye. Attention Wallyware shoppers! I’m realizing that my prices on these custom dog dishes and milk bone jars were a bit too high so I just slashed them way down for the summer. I think these are great items even if they do take a lot of time to make. So for the next couple of months I’m going to try them at roughly one third of the previous prices. Now the 7 inch custom dog bowl is $33.00, the 5 inch custom dog bowl is $27.50 and the 6 inch tall custom milk bone jar is just $33.00. 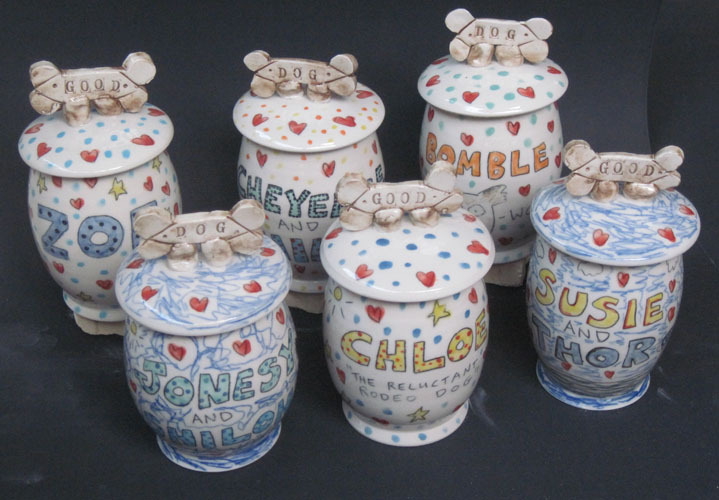 I will decorate whatever you want on these porcelain pots, and your dog will surely love the food contained inside them. Yeah, I know, that was a dumb advertising line I just fed you. Your dog would eat kibble out of an old used paint can, wouldn’t he? At any rate, you can place your orders by going to my online store! 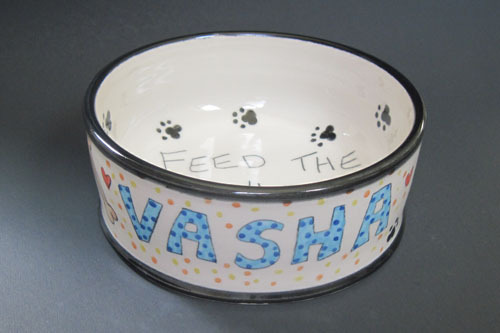 This entry was posted in Custom Orders and tagged custom dog bowls, dog bowls, dog dish, milk bone jars, porcelain, pottery dog dish. Bookmark the permalink.